Part Ten in a series on Colour. 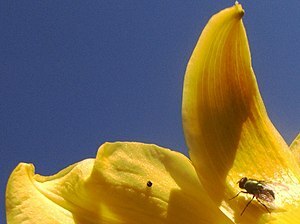 Yellow is the colour now in the Northern Hemisphere as spring skips into summer. Here in the tropics, yellow is always with us and sometimes taken for granted. Yellow is warmth without the burn, light without the glare, is resolute in the biblical charge to rejoice. If things happen or don’t which take me away from this sunny mood, well then, I can choose not to let the small stuff get to me. Storm clouds do gather as the wind carries them, distant thunder is heard, and the smell of rain is in the air. Yet there is light to see by, and the charge is also to look up.